loss? Certainly the sweet 16 is far better than an NIT championship. I'd rather win the NIT than lose in the first or second round of the NCAAs. Maybe that’s what’s wrong here . . . Winning it maybe. But losing early in the NIT would be a bigger shame than staying at home. I think losing in the NIT doesn't mean anything for a couple of reasons. 1) Nobody will notice, because nobody cares about the NIT. 2)People realize that our players don't care either and aren't motivated for the NIT, so they aren't playing with passion. It's kind of like missing the playoff in football and having to go play in a meaningless bowl. The team could be flat. Is it better to win the Belk Bowl or to lose in the CFP? Don’t ask a coot that question. They wouldn’t know how to compute the immense joy of either situation. 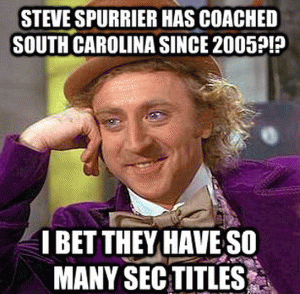 Re: Is it better to win the Belk Bowl or to lose in the CFP? If it’s different for you, that’s fine. Winning the NIT would really be like winning the Dollar General Bowl or R+L Carriers Bowl. I’m thinking those are probably around the 69th best teams playing in those bowls. There will be zero focus for our guys... being left out of the dance will be hard for them. I will not be surprised to see us get bounced early. Especially for our seniors. They have to be so disappointed that the season ended the way it did. If I were them I wouldn't even play. I would just try and stay healthy for their European careers. They still have nice careers ahead of them. Just my opinion, while winning the NIT would probably not do much for recruiting, it would give the seniors(Thomas, Mitchell, and Reed) some extra playing time to develop their skills if they have their eyes on the NBA. On the other hand, losing your first home game as we did in 2017 might cause the student section at Littlejohn to storm DRad's home wanting the imediate firing of Brad B. It's one of those Hoover Dam's if you do, and Grand Coulee Dam's if you don't. Thomas is the only one who has a slight chance on a NBA carer. They all have pro careers in Europe or somewhere else abroad. Also, the NIT, or any tournament for that matter, isn't going to develop their skills more at this stage. It could help our younger players though, if they get enough minutes. before the NCAA tournament got expended. Not so much today. I hope the Tigers will do well in the NIT. I always like to see the Tigers win least 20 games. Winning 20 games is a decent year for us. But yes This season overall has been a big disappointment overall. should have been chosen for the real tournament. Read through the list of schools in this 32 team field. At least one third are directional, cupcake schools that you might see on your schedule in November or December and would be embarrassed to lose to. I would say this particular team would have a 50/50 chance to lose to every one of those schools. I don’t know if that is because their style of play is conducive to low energy performances or lack of motivation but I’m pretty sure it’s not lack of athletes. I would prefer an entertaining style of basketball to a grinding, emotionless style.